1 Rank based on April 2006 IMF data. Russia (Russian: Росси́я, Rossiya; pronounced [rʌ'sʲi.jə]), also the Russian Federation (Russian: Росси́йская Федера́ция, Rossiyskaya Federatsiya; pronounced [rʌ'sʲi.skə.jə fʲɪ.dʲɪ'ra.ʦɪ.jə], listen ), is a country that stretches over a vast expanse of Eurasia. With an area of 17,075,400 square kilometres, it is the largest country in the world by land mass, covering almost twice the territory of the next-largest country, Canada. It has the world's eighth largest population. Russia shares land borders with the following countries (counter-clockwise from NW to SE): Norway, Finland, Estonia, Latvia, Lithuania, Poland, Belarus, Ukraine, Georgia, Azerbaijan, Kazakhstan, China, Mongolia, and North Korea. It is also close to the United States and Japan across relatively small stretches of water. Most of the area, population, and industrial production of the Soviet Union, then one of the world's two superpowers, lay in Russia. After the breakup of the Soviet Union, Russia's global role was greatly diminished compared to that of the former Soviet Union. In October 2005, the federal statistics agency reported that Russia's population has shrunk by more than half a million people dipping to 143 million, although Russia became the second country in the world by the number of immigrants from abroad. Prior to the Christian Era, the vast lands of Southern Russia were home to un-united tribes, such as Proto-Indo-Europeans and Scythians. Between the third and sixth centuries Common Era, the steppes were overwhelmed by successive waves of nomadic invasions, led by warlike tribes which would often move on to Europe, as was the case with Huns and Turkish Avars. A Turkic people, the Khazars, ruled South Russia through the eighth century. They were important allies of the Byzantine Empire and waged a series of successful wars against the Arab Califates. 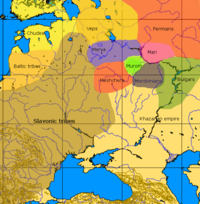 The Early East Slavs constituted the bulk of the population in Western Russia from the seventh century onwards and slowly assimilated the native Finno-Ugric tribes, such as the Merya, the Muromians and the Meshchera. In the mid-ninth century, a group of Scandinavians, the Varangians, assumed the role of a ruling elite at the Slavic capital of Novgorod. Although they were quickly assimilated by the predominantly Slavic population, the Varangian dynasty lasted several centuries, during which they affiliated with the Byzantine, or Orthodox church and moved the capital to Kiev in AD 882. In this era, the term "Rhos" or " Rus" first came to be applied to the Varangians and later also to the Slavs who peopled the region. As well as one of the rulers who contributed to the name "rus" [...] In the tenth to eleventh centuries this state of Kievan Rus became the largest in Europe and one of the most prosperous, due to diversified trade with both Europe and Asia. The opening of new trade routes with the Orient at the time of the Crusades contributed to the decline and fragmentation of Kievan Rus by the end of the twelfth century. In the eleventh and twelfth centuries common era, the constant incursions of nomadic Turkish tribes, such as the Kipchaks and the Pechenegs, led to the massive migration of Slavic populations from the fertile south to the heavily forested regions of the north, known as Zalesye. The medieval states of Novgorod Republic and Vladimir-Suzdal emerged as successors to Kievan Rus on those territories, while the middle course of the Volga River came to be dominated by the Muslim state of Volga Bulgaria. Like many other parts of Eurasia, these territories were overrun by the Mongol invaders, who formed the state of Golden Horde which would pillage the Russian principalities for over three centuries. Later known as the Tatars, they ruled the southern and central expanses of present-day Russia, while the territories of present-day Ukraine and Belarus were incorporated into the Grand Duchy of Lithuania and Poland, thus dividing the Russian people in the north from the Belarusians and Ukrainians in the west. Similarly to the Balkans and Asia Minor, long-lasting nomadic rule retarded the country's economic and social development. However, the Novgorod Republic together with Pskov retained some degree of autonomy during the time of the Mongol yoke and was largely spared the atrocities that affected the rest of the country. Led by Alexander Nevsky, the Novgorodians repelled the Germanic crusaders who attempted to colonize the region. Unlike its spiritual leader the Byzantine Empire, Russia under the leadership of Moscow was able to revive and organized its own war of reconquest, finally subjugating its enemies and annexing their territories. After the fall of Constantinople in 1453, Muscovite Russia remained the only more or less functional Christian state on the Eastern European frontier, allowing it to claim succession to the legacy of the Eastern Roman Empire. While still under the domain of the Mongol- Tatars and with their connivance, the duchy of Moscow began to assert its influence in Western Russia in the early fourteenth century. Assisted by the Russian Orthodox Church and Saint Sergius of Radonezh's spiritual revival, Muscovy inflicted a defeat on the Mongol-Tatars in the Battle of Kulikovo (1380). Ivan the Great eventually tossed off the control of the invaders, consolidated surrounding areas under Moscow's dominion and first took the title "grand duke of all the Russias". In the beginning of the sixteenth century, the Russian state set the national goal to return all Russian territories lost as a result of the Tatar invasion and to protect the southern borderland against attacks of Crimean Tatars and other Turkic peoples. The noblemen, receiving a manor from the sovereign, were obliged to serve in the military. The manor system became a basis for the nobiliary horse army. In 1547, Ivan the Terrible was officially crowned the first Tsar of Russia. During his long reign, Ivan annexed the Muslim polities along the Volga River and transformed Russia into a multiethnic and multiconfessional state. By the end of the century, Russian Cossacks established the first settlements in Western Siberia. In the middle of the seventeenth century there were Russian settlements in Eastern Siberia, on Chukchi Peninsula, along the Amur River, on the Pacific coast, and the strait between North America and Asia was first sighted by a Russian explorer in 1648. The colonization of the Asian territories was largely peaceful, in sharp contrast to the build-up of other colonial empires of the time. Muscovite control of the nascent nation continued after the Polish intervention of under the subsequent Romanov dynasty, beginning with Tsar Michael Romanov in 1613. Peter the Great (ruled in) defeated Sweden in the Great Northern War, forcing it to cede Ingria, Estland, and Livland. It was in Ingria that he founded a new capital, Saint Petersburg. Peter succeeded in bringing ideas and culture from Western Europe to a severely underdeveloped Russia. After his reforms, Russia emerged as a major European power. Catherine the Great, ruling from 1762 to 1796, continued the Petrine efforts at establishing Russia as one of the great powers of Europe. Examples of its eighteenth-century European involvement include the War of Polish Succession and the Seven Years' War. In the wake of the Partitions of Poland, Russia had taken territories with the ethnic Belarusian and Ukrainian population, earlier parts of Kievan Rus'. As a result of the victorious Russian-Turkish wars, Russia's borders expanded to the Black Sea and Russia set its goal on the protection of Balkan Christians against a Turkish yoke. In 1783, Russia and the Georgian Kingdom (which was almost totally devastated by Persian and Turkish invasions) signed the treaty of Georgievsk according to which Georgia received the protection of Russia. In 1812, having gathered nearly half a million soldiers from France, as well as from all of its conquered states in Europe, Napoleon invaded Russia but, after taking Moscow, was forced to retreat back to Europe. Almost 90% of the invading forces died as a result of on-going battles with the Russian army, guerillas and winter weather. The Russian armies ended their pursuit of the enemy by taking his capital, Paris. The officers of the Napoleonic wars brought back to Russia the ideas of liberalism and even attempted to curtail the tsar's powers during the abortive Decembrist revolt (1825), which was followed by several decades of political repression. Another result of the Napoleonic wars was the incorporation of Bessarabia, Finland, and Congress Poland into the Russian Empire. The perseverance of Russian serfdom and the conservative policies of Nicholas I of Russia impeded the development of Imperial Russia in the mid-nineteenth century. As a result, the country was defeated in the Crimean War, 1853–1856, by an alliance of major European powers, including Britain, France, Ottoman Empire, and Piedmont-Sardinia. Nicholas's successor Alexander II (1855–1881) was forced to undertake a series of comprehensive reforms and issued a decree abolishing serfdom in 1861. The Great Reforms of Alexander's reign spurred increasingly rapid capitalist development and Sergei Witte's attempts at industrialization. The Slavophile mood was on the rise, spearheaded by Russia's victory in the Russo-Turkish War, which forced the Ottoman Empire to recognize the independence of Romania, Serbia and Montenegro and autonomy of Bulgaria. The failure of agrarian reforms and suppression of the growing liberal intelligentsia were continuing problems however, and on the eve of World War I, the position of Tsar Nicholas II and his dynasty appeared precarious. Repeated devastating defeats of the Russian army in the Russo-Japanese War and World War I, and the consequent deterioration of the economy led to widespread rioting in the major cities of the Russian Empire, and ultimately to the overthrow in 1917 of the Romanovs. At the close of this Russian Revolution of 1917, a Marxist political faction called the Bolsheviks seized power in Petrograd and Moscow under the leadership of Vladimir Lenin. The Bolsheviks changed their name to the Communist Party. A bloody civil war ensued, pitting the Bolsheviks' Red Army against a loose confederation of anti-socialist monarchist and bourgeois forces known as the White Army. The Red Army triumphed, and the Soviet Union was formed in 1922. St. 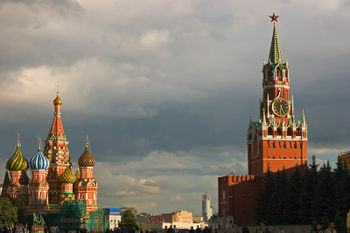 Basil's Cathedral and the Spasskaya Tower of the Kremlin in Moscow's Red Square. The Soviet Union was meant to be a trans-national worker's state free from nationalism. The concept of Russia as a separate national entity was therefore not emphasized in the early Soviet Union. Although Russian institutions and cities certainly remained dominant, many non-Russians participated in the new government at all levels. One of these was a Georgian named Joseph Stalin. After Lenin's death in 1924, a brief power struggle ensued, during which Stalin gradually eroded the various checks and balances which had been designed into the Soviet political system and assumed dictatorial power by the end of the decade. Leon Trotsky and almost all other Old Bolsheviks from the time of the Revolution were killed or exiled. At the end of 1930s, Stalin launched the Great Purges, a massive series of political repressions. Millions of people whom Stalin and local authorities suspected of being a threat to their power were executed or exiled to Gulag labor camps in remote areas of Siberia or Central Asia. Stalin forced rapid industrialization of the largely rural country and collectivization of its agriculture. In 1928, Stalin introduced his "First Five-Year Plan" for modernizing the Soviet economy. Most economic output was immediately diverted to establishing heavy industry. Civilian industry was modernized and many heavy weapon factories were established. The plan worked, in some sense, as the Soviet Union successfully transformed from an agrarian economy to a major industrial powerhouse in an unbelievably short span of time, but widespread misery and famine ensued for many millions of people as a result of the severe economic upheaval. After the Great Patriotic War started in 1941 the German army had considerable success in the early stages of the campaign, they suffered defeat when they reached the outskirts of Moscow. The Red Army then stopped the Nazi offensive at the Battle of Stalingrad in 1943, which became the decisive turning point for Germany's fortunes in the war. The Soviets drove through Eastern Europe and captured Berlin before Germany surrendered in 1945 (see Great Patriotic War). During the war, the Soviet Union lost more than 27 million [citizens] (including eighteen million [civilians]). Although ravaged by the war, the Soviet Union emerged from the conflict as an acknowledged superpower. The Red Army occupied Eastern Europe after the war, including the eastern half of Germany. Stalin installed loyal communist governments in these satellite states. During the immediate postwar period, the Soviet Union first rebuilt and then expanded its economy, with control always exerted exclusively from Moscow. The Soviets extracted heavy war reparations from the areas of Germany under their control, mostly in the form of machinery and industrial equipment. The Soviet Union consolidated its hold on Eastern Europe (see Eastern bloc). The United States helped the Western European countries establish democracies, and both countries sought to achieve economic, political, and ideological dominance over the Third World. The ensuing struggle became known as the Cold War, which turned the Soviet Union's wartime allies, the United Kingdom and the United States, into its foes. Stalin died in early 1953 presumably without leaving any instructions for the selection of a successor. His closest associates officially decided to rule the Soviet Union jointly, but the secret police chief Lavrenty Beria appeared poised to seize dictatorial control. General Secretary Nikita Khrushchev and other leading politicians organized an anti-Beria alliance and staged a coup d'état. Beria was arrested in June 1953 and executed later that year; Khrushchev became the undisputed leader of the Soviet Union. Under Khrushchev, the Soviet Union launched the world's first artificial satellite, Sputnik 1, and the Soviet cosmonaut Yuri Gagarin became the first person to orbit the Earth. Khrushchev's reforms in agriculture and administration, however, were generally unproductive, and foreign policy toward China and the United States suffered reverses, notably the Cuban Missile Crisis, when he began installing nuclear missiles in Cuba (after the United States installed Jupiter missiles in Turkey which nearly provoked a war with the Soviet Union). Over the course of several angry outbursts at the United Nations, Khrushchev was increasingly seen by his colleagues as belligerent, boorish, and dangerous. The remainder of the Soviet leadership removed him from power in 1964. Following the ousting of Khrushchev, another period of rule by collective leadership ensued, lasting until Leonid Brezhnev established himself in the early 1970s as the pre-eminent figure in Soviet political life. Brezhnev is frequently derided by historians for stagnating the development of the Soviet Union (see " Brezhnev stagnation"). In contrast to the revolutionary spirit that accompanied the birth of the Soviet Union, the prevailing mood of the Soviet leadership at the time of Brezhnev's death in 1982 was one of aversion to change. In the mid 1980s, the reform-minded Mikhail Gorbachev came to power. He introduced the landmark policies of glasnost (openness) and perestroika (restructuring), in an attempt to modernize Soviet communism. Glasnost meant that the harsh restrictions on free speech that had characterized most of the Soviet Union's existence were removed, and open political discourse and criticism of the government became possible again. Perestroika meant sweeping economic reforms designed to decentralize the planning of the Soviet economy. However, his initiatives provoked strong resentment amongst conservative elements of the government, and an unsuccessful military coup that attempted to remove Gorbachev from power instead led to the collapse of the Soviet Union. Boris Yeltsin came to power and declared the end of exclusive Communist rule. The USSR splintered into fifteen independent republics, and was officially dissolved in December of 1991 (see History of the Soviet Union). Since then, Russia has struggled in its efforts to build a democratic political system and a market economy to replace the strict centralized social, political, and economic controls of the Soviet era. Prior to the dissolution of the Soviet Union, Boris Yeltsin had been elected President of Russia in June 1991 in the first direct presidential election in Russian history. In October 1991, as Russia was on the verge of independence, Yeltsin announced that Russia would proceed with radical market-oriented reform along the lines of " shock therapy". After the disintegration of the USSR, the Russian economy went through a crisis. Russia took up the responsibility for settling the USSR's external debts, even though its population made up just half of the population of the USSR at the time of its dissolution. The largest state enterprises (petroleum, metallurgy, and the like) were controversially privatized for the small sum of $US 600 million, far less than they were worth, while the majority of the population plunged into poverty. Russia's Congress of People's Deputies, in which the Communist presence was the strongest, attempted to impeach Yeltsin on March 26, 1993. Yeltsin's opponents gathered more than 600 votes for impeachment, but fell 72 votes short. On September 21, 1993, Yeltsin disbanded the Supreme Soviet and the Congress of People's Deputies by decree, which was illegal under the constitution. On the same day there was a military showdown, the Russian constitutional crisis of 1993. With military help, Yeltsin held control. The conflict resulted in a number of civilian casualties, but was resolved in Yeltsin's favour. According to different sources, the total number of deceased was between 300 and 2,000 people. Elections were held and the current Constitution of the Russian Federation was adopted on December 12, 1993. The 1990s were plagued by armed ethnic conflicts in the North Caucasus. Such conflicts took a form of separatist insurrections against federal power (most notably in Chechnya), or of ethnic/clan conflicts between local groups (e.g., in North Ossetia-Alania between Ossetians and Ingushs, or between different clans in Chechnya). Since the Chechen separatists declared independence in the early 1990s, an intermittent guerrilla war ( First Chechen War, Second Chechen War) has been fought between disparate Chechen groups and the Russian military. Some of these groups have grown increasingly Islamist over the course of the struggle. The total number of refugees and internally displaced persons from these territories today is about 100,000 people. After Yeltsin's presidency in the 1990s, the former head of the FSB Vladimir Putin was elected in 2000. Although President Putin is still the most popular Russian politician, with a 70% approval rating, his policies raised serious concerns about civil society and human rights in Russia. The West and particularly the United States expressed growing worries about the state control of the Russian media through Kremlin-friendly companies, government influence on elections, and law enforcement abuses. At the same time, high oil prices and growing internal demand boosted Russian economic growth, stimulating significant economic expansion abroad and helping to finance increased military spending. Putin's presidency has shown improvements in the Russian standard of living, as opposed to the 1990s .Even with these economic improvements, the government is criticized for lack of will to fight wide-spread crime and corruption and to renovate deteriorated urban infrastructure throughout the country. Despite the economic distress and decreased military funding following the fall of the Soviet Union, the country retains its large weapons and especially nuclear weapons arsenal. The politics of Russia (the Russian Federation) take place in a framework of a federal presidential republic, whereby the President of Russia is both head of state and head of government, and of a pluriform multi-party system. Executive power is exercised by the government. Legislative power is vested in both the government and the two chambers of the Federal Assembly of the Russian Federation. The basic subdivision of the Russian Federation is that of the federal subject. There are 88 federal subjects. Each federal subject is a constituent part of the federation. There are many different types of federal subject. 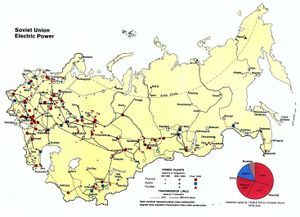 There are 21 republics within the federation that enjoy a high degree of autonomy on most issues and these correspond to some of Russia's numerous ethnic minorities. The other subjects consist of 48 oblasts (provinces) and 7 krais (territories), as well as 9 autonomous okrugs (autonomous districts), and 1 autonomous oblast. Beyond these there are two federal cities (Moscow and St. Petersburg). There are also seven large federal districts (four in Europe, three in Asia). These have been added as a new layer between the above subdivisions and the national level. Unlike the federal subjects, the federal districts are not as such a subnational level of government, but are a level of administration of the national government. The Russian Federation stretches across much of the north of the supercontinent of Eurasia. Although it contains a large share of the world's Arctic and sub-Arctic areas, and therefore has less population, economic activity, and physical variety per unit area than most countries, the great area south of these still accommodates a great variety of landscapes and climates. Russia is the coldest country in the world. The mid-annual temperature is −5.5°C (22° F). For comparison, the mid-annual temperature in Iceland is 1.2°C (34°F) and in Sweden is 4°C (39°F), although the variety of climates within Russia makes such a comparison somewhat misleading. Most of the land consists of vast plains, both in the European part and the part of Asian territory, that is largely known as Siberia. 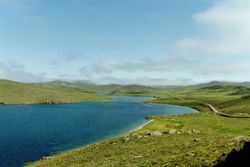 These plains are predominantly steppe to the south and heavily forested to the north, with tundra along the northern coast. The permafrost (areas of Siberia and the Far East) occupies more than half of the territory of Russia. 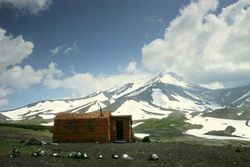 Mountain ranges are found along the southern borders, such as the Caucasus (containing Mount Elbrus, Russia's and Europe's highest point at 5,642 m / 18,511 ft) and the Altai, and in the eastern parts, such as the Verkhoyansk Range or the volcanoes on Kamchatka. The more central Ural Mountains, a north-south range that form the primary divide between Europe and Asia, are also notable. 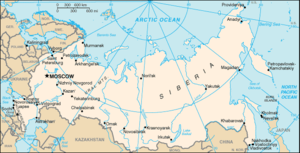 Russia has an extensive coastline of over 37,000 kilometres (23,000 mi) along the Arctic and Pacific Oceans, as well as more or less inland seas such as the Baltic, Black and Caspian seas. Some smaller bodies of water are part of the open oceans; the Barents Sea, White Sea, Kara Sea, Laptev Sea and East Siberian Sea are part of the Arctic, whereas the Bering Sea, Sea of Okhotsk and the Sea of Japan belong to the Pacific Ocean. Major islands found in them include Novaya Zemlya, the Franz Josef Land, the New Siberian Islands, Wrangel Island, the Kuril Islands and Sakhalin. (See List of islands of Russia). The Diomede Islands (one controlled by Russia, the other by the United States) are just three kilometres (1.9 mi) apart, and Kunashir Island (controlled by Russia but claimed by Japan) is about twenty kilometres (12 mi) from Hokkaido. Many rivers flow across Russia; see Rivers of Russia. The most practical way to describe Russia is as a main part (a large contiguous portion with its off-shore islands) and an exclave, Kaliningrad, (at the southeast corner of the Baltic Sea). The Baltic and Black Sea coasts of Russia have less direct and more constrained access to the high seas than its Pacific and Arctic ones, but both are nevertheless important for that purpose. The Baltic gives immediate access to the nine other countries sharing its shores, and between the main part of Russia and its Kaliningrad Oblast exclave. Via the straits that lie within Denmark, and between it and Sweden, the Baltic connects to the North Sea and the oceans to its west and north. The Black Sea gives immediate access to the five other countries sharing its shores, and via the Dardanelles and Marmora straits adjacent to Istanbul, Turkey, to the Mediterranean Sea with its many countries and its access, via the Suez Canal and the Straits of Gibraltar, to the Atlantic and Indian Oceans. The salt waters of the Caspian Sea, the world's largest lake, provide no access to the high seas. The Russian Federation spans eleven time zones. As of 2005 Russia has 13 cities with over a million inhabitants. After the breakup of the Soviet Union, Russia's first slight recovery, showing signs of open-market influence, occurred in 1997. That year, however, the Asian financial crisis culminated in the August depreciation of the ruble. This was followed by a debt default by the government in 1998, and a sharp deterioration in living standards for most of the population. Consequently, 1998 was marked by recession and an intense capital flight. 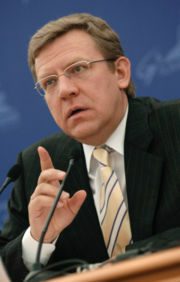 Alexei Kudrin, Russian finance minister. Nevertheless, the economy started recovering in 1999. The recovery was greatly assisted by the weak ruble, which made imports expensive and boosted local production. Then it entered a phase of rapid economic expansion, the GDP growing by an average of 6.7% annually in 1999–2005 on the back of higher petroleum prices, a weaker ruble, and increasing service production and industrial output. 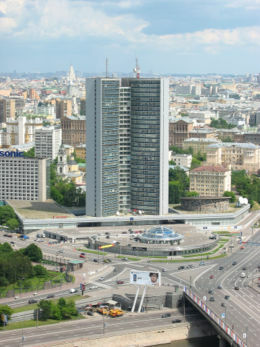 The country is presently running a huge trade surplus, which has been helped by protective import barriers, and rampant corruption which ensures that it is almost impossible for foreign and local SMEs (small and medium sized enterprises) to import goods without the help of local specialist import firms, such as the Russia Import Company. Some import barriers are expected to be abolished after Russia's accession to the WTO. The recent recovery, made possible due to high world oil prices, along with a renewed government effort in 2000 and 2001 to advance lagging structural reforms, has raised business and investor confidence over Russia's prospects in its second decade of transition. Russia remains heavily dependent on exports of commodities, particularly oil, natural gas, metals, and timber, which account for about 80% of exports, leaving the country vulnerable to swings in world prices. Industrial military exports after undergoing sharp contraction is now the major non-commodity export. In recent years, however, the economy has also been driven by growing internal consumer demand that has increased by over 12% annually in 2000–2005, showing the strengthening of its own internal market. The country's GDP (PPP) soared to $1.5 trillion in 2004, making it the ninth largest economy in the world and the fifth largest in Europe. If the current growth rate is sustained, the country is expected to become the second largest European economy after Germany and the sixth largest in the world within a few years. In 2005, according to the Federal Service of State Statistics, GDP reached $765 billion nominally (21.7 trillion rubles), equal to $1.6 trillion in international dollars (PPP; purchasing power parity). Inflation was 10.9% percent. Expenditures of the consolidated budget have reached 5942 billion rubles ($215 billion). The government plans to reduce the tax burden, although the time and scale of such a reduction remains undecided. In 2005 Russia exported $241.3 billion dollars and imported $98.5 billion dollars. This means that Russia registered a trade surplus of $142.8 billion dollars in 2005, up about 33% from 2004's foreign trade surplus of $106.1 billion dollars. By August 17, 2006, Russia's international reserves reached $277 billion nominally and projected to grow to $320 billion by the end of this year and to $350–450 billion by the end of 2007 . Thanks to high oil prices, Russian oil exports totaled $117 billion in 2005 while gas exports totaled $32 billion in the same year. That means that oil and gas made up 60% of total Russian exports in 2005. Knowing the importance of oil and gas to the economy, a Stabilization Fund was formed by the government in January 2004. This fund takes in windfall revenues from oil and gas exports and is designed to help offset oil market volatility. This fund was also set up in order to prevent the ruble from appreciating. The Stabilization Fund (SF) grew to $76.6 billion in November 2006. Russia's Deputy Prime Minister Alexander Zhukov said in October 2006 the fund will continue to increase over the coming years, and will exceed $149 billion by late 2007 and about $260.4 billion by the end of 2009. Russia is paying off its foreign debt mainly from the Stabilization Fund, which hit $76.9 billion as of July 1. Russia repaid the bulk of its outstanding debt to the Paris Club of Creditor Nations on August 18-21. The debt totaled $1.9 billion as of October 1, compared to $23.7 billion on July 1. According to the Federal State Statistics Service of Russia, the monthly nominal average salary in June 2006 was about 10,975 rubles (about $408 nominally; about $740 PPP), 25.6 percent higher than in June 2005 and 7 percent more than in May 2006. Some perceive the greatest challenge facing the Russian economy to be encouraging the development of Small and Medium-sized Enterprises in a business climate with a young and less-than-sufficient functional banking system. Few of Russia's banks are owned by oligarchs, who often use the deposits to lend to their own businesses. The 2005 Milken Institute's ratings place Russia at the 51st place in the world, out of 121 countries by the availability of capital. However, about twenty-five of the biggest banks of Russia get entry into Top 1000 banks of the world by The Banker . Many more Russian banks have very high international ratings by Moody's and Fitch, including "investment" level. The arrest of Russia's wealthiest businessman Mikhail Khodorkovsky on charges of fraud and corruption in relation to the large-scale privatizations organized under then-President Yeltsin, contrary to some expectations, has not caused most foreign investors to worry about the stability of the Russian economy. Most of the large fortunes currently in evidence in Russia are the product of either acquiring government assets at particularly low costs or gaining concessions from the government. Other countries have expressed concerns and worries at the "selective" application of the law against individual businessmen, though government actions have been received positively in Russia. Encouraging foreign investment is also a major challenge due to legal, cultural, linguistic, economic and political peculiarities of the country. Nevertheless, there has been a significant inflow of capital in recent years from many European investors attracted by cheaper land, labor and higher growth rates than in the rest of Europe. 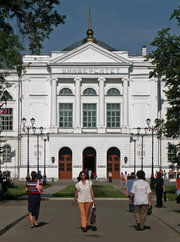 Very high levels of education and societal involvement achieved by the majority of the population, including women and minorities, secular attitudes, mobile class structure, and better integration of various minorities into the mainstream culture set Russia far apart from the majority of the so-called developing countries and even some developed nations. The country is also benefiting from rising oil prices and has been able very substantially to reduce its formerly huge foreign debt. However, equal redistribution of capital gains from the natural resource industries to other sectors is still a problem. Nonetheless, since 2003, exports of natural resources started decreasing in economic importance as the internal market has strengthened considerably, largely stimulated by intense construction, as well as consumption of increasingly diverse goods and services. Yet teaching customers and encouraging consumer spending is a relatively tough task for many provincial areas where consumer demand is primitive. However, some laudable progress has been made in larger cities, especially in the clothing, food, and entertainment industries. Additionally, some international firms are investing in Russia. According to the International Monetary Fund (IMF), Russia had nearly $26 billion in cumulative foreign direct investment inflows during the period (of which $11.7 billion occurred in 2004). Russia faces considerable income inequalities that hinder Russia's potential to become a more diversified economy. Despite its comparatively high population, Russia has a low average population density due to its enormous size. Population is densest in the European part of Russia, in the Ural Mountains area, and in the south-western parts of Siberia; the south-eastern part of Siberia that meets the Pacific Ocean, known as the Russian Far East, is sparsely populated, with its southern part being densest. The Russian Federation is home to as many as 160 different ethnic groups and indigenous peoples. As of the Russian Census (2002), 79.8% of the population is ethnically Russian, 3.8% Tatar, 2% Ukrainian, 1.2% Bashkir, 1.1% Chuvash, 0.9% Chechen, 0.8% Armenian. The remaining 10.3% includes those who did not specify their ethnicity as well as (in alphabetical order) Assyrians, Avars, Azeris, Belarusians, Bulgarians, Buryats, Chinese, Cossacks, Estonians, Evenks, Finns, Georgians, Germans, Greeks, Ingushes, Inuit, Jews, Kalmyks, Karelians, Kazakhs, Koreans, Kyrgyz, Lithuanians, Latvians, Maris, Mongolians, Mordvins, Nenetses, Ossetians, Poles, Romanians, Tajiks, Tuvans, Turkmen, Udmurts, Uzbeks, Yakuts, and others. Nearly all of these groups live compactly in their respective regions; Russians are the only people significantly represented in every region of the country. 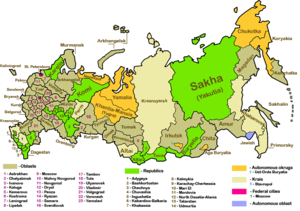 The Russian language is the only official state language, but the individual republics have often made their native language co-official next to Russian. The Cyrillic alphabet is the only official script, which means that these languages must be written in Cyrillic in official texts. The Russian Orthodox Church is the dominant Christian religion in the Federation. Islam is the second most widespread religion. Hindus make up a small but fast-growing minority, particularly followers of the ISKCON movement. Other religions include various Protestant churches, Judaism, Roman Catholicism and Buddhism. Induction into religion takes place primarily along ethnic lines. Ethnic Russians are mainly Orthodox whereas most people of Turkic and Caucasian extraction are Sunni Muslim. However, after years of religious suppression under communism, the level of observance of these religious creeds is very low. The name of the country derives from the name of the Rus' people. The origin of the people itself and of their name is a matter of some controversy.